This is a question that comes up a lot in lessons and at the lake for coaches. Considering athletes are not turning each 25 meters or 50 meters, they should be significantly quicker in a wetsuit in OW, right? What could be going wrong? Distance from zig-zaggy swimming is usually the culprit, but if the GPS reports back that your athlete was a fraction over 3.8 kilometers for an IRONMAN-length swim or around 1500 meters for and Olympic-length swim, what else might be slowing them down? If we eliminate the obvious (distance, since just a little meandering could easily add 200-300 meters and 3:30-6:00 minutes to your time), then what remains? 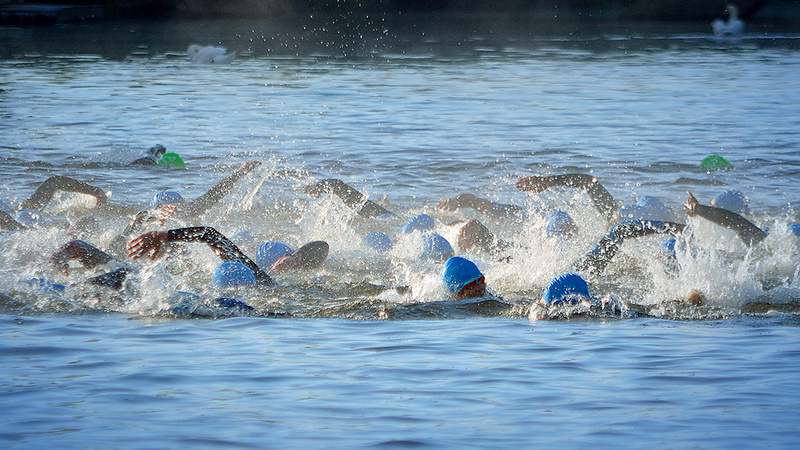 Whether it is a triathlon, otilo, aquabike, aquathon, or pure swim, we can divide an OW swim into various segments: pre-race, water warmup, start, mid-race, end of swim, and exit. There is room for improvement in each segment, and we can also explore other key areas to find ways to speed up times. Drylands and warm-ups are key areas to factor into swimming better on race day. Most pool-based sessions will have 20-30 minutes of swimming ahead of any fast work to prepare stroke technique and increase the heart rate. Prior to getting into a pool-based session many coaches will encourage some gentle arm swings to prepare the body for the harder work. This can be useful if you want a longer main set, but only have a 60 minute window available. On race day, I appreciate the fact that there are 1,001 things to prepare for, but a dryland warm-up really helps. This is especially true since time in the water is limited and cool making “warming up” harder. Often, the warm-up area is chaotic and full of swimmers going in all directions making a sustained swim almost impossible. Most arrive on the starting line cold, technically deficient compared to a pool swim, and wearing a poorly-fitting wetsuit that hinders rather than helps. An athlete’s wetsuit can be a source of irritation and result in a loss of speed for a variety of reasons. If a wetsuit is too small the material in the arms and legs will pull away from the body fatiguing your athlete as it stretches during the kick and pull. There also might be problems breathing due to constriction around the chest, and, if the suit is too short in the body, will make the athlete cramped and uncomfortable. On the other hand, if the suit is too big and floods with water athletes will fatigue as they carry extra weight around the course. If you can quite easily get the suit on in under a couple of minutes then I would suspect it is too big and you should try something smaller. Also, a surf wetsuit is neither buoyant or warm and should be avoided. Wetsuits can also be too buoyant, which causes issues. As swim technique improves, suits will no longer be needed to keep the swimmer afloat. If your athlete cannot hold their body in a neutral position, it is very hard for the legs to assist rotation and body position since they will spend a lot of time at or above the surface. If the legs and chest are too buoyant, then the swimmer will arch their back making swimming faster harder. The swimmer will constantly be held in a “head up” position creating the feeling that they are continually sighting and putting the brakes on. Are the pool sessions you are prescribing preparing your athletes for a harder swim in OW? Are you challenging them to swim over race distance so they know they are competent at the distance and can also swim it with some speed? Entering swim-only events is a great way of testing swim pacing and strategies. Nothing beats training in OW to get a feel for pace. Pool sessions don’t simulate OW conditions well and can create a gulf between cruise pool speed and OW race speed. A hard training swim in a lake followed by a cycling workout might provide some insight to limits in the swim. There should not be enough rest to recover, but just enough to help them keep the pace high. Instruct your athletes to start their watch as they push off into the first 400 meters and subtract 4:05 minutes from their total time to estimate their 3.8 km time. Test again in a month and push a little harder. Faster? Too fast? Heart rate too high? A little experience will help you find the best pace. You might be surprised how congested the back of an OW start can be, and adding breaststrokers to the mix makes overtaking very hard. By no means am I suggesting starting at the front if an athlete isn’t confident with their speed, but they could be giving away minutes each race. With additional race experience, athletes might be prepared for a higher start on the grid where a faster start, more options for drafting, and opportunities to receive a “tow” can be taken advantage of. Starting too high can also lead to issues if swimming is not a strength. Athletes may be driven off course by advancing packs of swimmers resulting in additional sighting as they need to navigate more frequently. Learning to settle into an effective mid-race cruise is essential after the excitement of a swim start. It’s important not to swim too slowly and exit off the pace, but equally important to know when to calm down after the excitement of the start. Athletes should pull on the steadier mid-race cruise (MRC). Leg kick will assist swim speed to a point, however, too much will leave your athlete fatigued for the bike. The absence of kicking will put more pressure on the arms, slow the athlete down, and result in the same amount of fatigue. Athletes will find a better balance when the full body contributes by recruiting more muscles to do less work keeping them fresh for the bike. I recall a popular race in the UK that had a busy “M” shaped route with an additional dogleg and exit. Lots of sharp turns required lots of sighting and slowed progress. Compare that course to a “U”, for instance, with a simple entrance and exit. When I raced Tri Standard distance competitively I would try to avoid comparing races, but it was sometimes helpful looking at an average of a few of them to see how the season was really going. So, if you are comparing a few OW races to your pool speed check to see if they are slow races (i.e. complex courses). It is useful to look at pro times and mid-pack times from race to race to get a feel for the speed of the course. Going too fast and blowing up and drafting off of someone slow who drags you around to a slow time will leave you equally frustrated and annoyed. Swimming on someone’s feet is perhaps the best position for the best streamline and the most hydrodynamic gains, but after spending part of the year working on catch position, feel for the water, hand shape, hold on the water, and lowering bubble creation athletes spend the race sitting in bubbly kick water avoiding stabbing people’s heels. No wonder it can be tricky deciding if the pace is too fast or too slow. I prefer to sit on people’s hips so I can look for calmer, cleaner water and get a more accurate idea of my swim pace. Too fast and I let them go. Not quick enough and I drop them to join a faster group going by. I teach the concept of trying to be an adaptable swimmer. Being able to change tactics and technique as conditions dictate can be helpful. As conditions change, the stroke (especially tempo) can adapt to take advantage of changing weather or water conditions and assist your swim speed. Keep in mind, lengthening and stretching out the stroke or lowering stroke count against a slight current will slow swimmers dramatically. Speeding up stroke turnover in coordination with the flow might not be the best use of economy of effort, either. Arriving early and watching earlier waves swim, if possible, for clues about the water conditions can help your swim. Is there any wildlife floating on the water in a river you are about to race in? How fast is it flowing? Are the ducks struggling to stay stationary? Encourage your athletes to adjust their technique based on what they see and feel in the water. Are you comparing like for like and being fair to yourself? There is a vast difference between a 100 meter FC repeat in a 50 meter pool with a good turn while sitting on someone’s feet wearing neoprene shorts and 100 meters in a 25 meter pool without drafting and three slow turns. What you are you using when you say “pool speed”? There could be as much as 10 second difference between 100 meters in those two pool lengths. Over 3.8 km is a long distance. Your comparison might not be as bad as you thought depending on how you are gauging your pool-based swims.